You demanded it! At the end of the second installment of our look at the original Monster Manual we solicited suggestions from readers. We asked for topics for future articles. 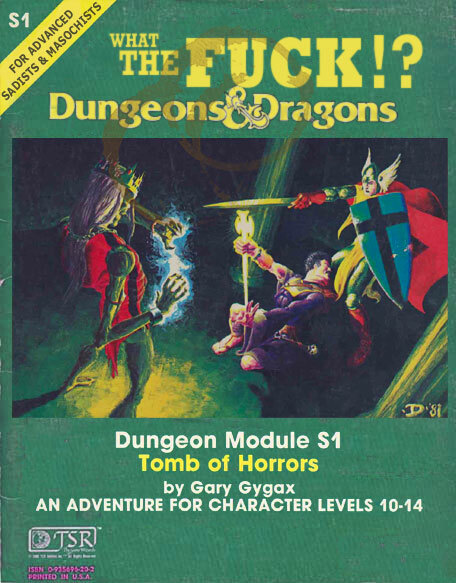 There were a lot of great offerings, but none came up in the emails more than the legendary Dungeon Module S1 entitled "Tomb of Horrors." Gary Gygax prefaces the module with a warning that it is a "thinking man's adventure." Let's hope you like thinking about your own suffering. Zack: A few weeks ago we requested suggestions for future articles. We received a ton of emails about stupid D&D books and stupid products from various other RPG systems. One title kept coming up. Steve: Was it Rifts? I bet it was Rifts. All I gotta say is "Tomb of Horrors". It's full of batshit insanity and borderline impossible gaming. There's a reason they sell bumper stickers that say "I survived the Tomb of Horrors". In the gaming world, it's truly an accomplishment. Steve: Two things. First off, she sent that to "us"? Because I don't think she sent that to me. You used your email address and then never showed me any of the emails even though you said you would. So she sent that to you. Also, Katie, how is it going? Do you like frenching? How about top off frenching? You down? Zack: Katie's email is a good example of the attitude most people had towards "Tomb of Horrors." It has a reputation as the cruelest module ever devised and it is elevated to legendary status because it was penned by Gygax himself. Steve: God asked Abraham to burn his only level 11 fighter-mage to prove his faith. Zack: We are going to brave the Tomb of Horrors, and its many traps and silly player handouts, so that you don't have to. Steve: Nobody really has to brave the Tomb of Horrors. Do they? Steve: Oh, okay, good. I thought there might be some new rule I hadn't heard about. Steve: Obama is changing things.